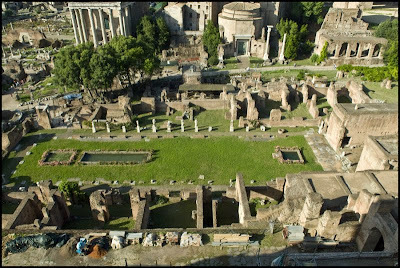 Located around the center of the Roman Forum area ruins is the Regia. Stand on the Via Sacra with the south side of the Regia before you. In front of you is the #27: Temple of Antoninus and Faustina and behind you is the House of the Vestal Virgins (Atrium Vestae) and the Temple of Vesta. ( Photos 1, photo 3, photo 4 ). Directly in front of you is the "Shrine of Mars", a room in the SW (left-bottom) corner of the Regia (all that remains is just the floor). ( Photo 8 ) It's a rectangular area made from stone blocks (some missing). It has a circular grassy mound on it (beneath this mound is a stone circle-2.53 m diameter), this was probably the altar (or hearth?) that held the "Sacred Spears of Mars". It's the evening of March 14, 44 BC, a violent thunderstorm rages (?) that night. It's looked upon as an ill omen. Julius Caesar enters the "Shrine of Mars". In four days he leaves for war with Parthia (Iran and surrounding areas) but tomorrow after the Senate meeting his friend Marcus Aemilius Lepidus "Master of the Horse" (Commander of the Cavalry) will leave (?) for Parthia also. They will also dine together that night. It's written that while Julius Caesar was in the Shrine that night the "Sacred Spears" started to vibrate/rattle/move on their own. Legend has it that they only do this when something terrible is about to happen. It is not the first omen or warning Julius Caesar has received and it will not be his last! [I wonder if Julius Caesar was there with his friend Lepidus to ask the God Mars for his help/blessing in their upcoming war? Generals would go into the Shrine and rattle the Spears (for luck, blessing, prayer) before they would depart for war. Also I wonder if the violent thunderstorm recorded (?) that night was raging at that moment? Could the sonic boom from a nearby lightening strike have caused the Spears to vibrate? Was this omen just a myth? Or could it have actually happened? It's been said (?) that the Spears might have been *delicately* balanced somehow, like an ancient seismograph.] Now look to your right ( Photo 2 ) and you will see a small grove of trees that appear in the photos below. Now then, when you actually get your 'boots on the ground' things look quite different. Hop the fences to get a good look at things, as in this photo. www.photoroma.com/foto.php?City=rm&ID1=1127&ID2=0 shows the real view of the stylobate, with the Atrium behind it. To the left of that half-column in the stylobate was the main entrance used by Julius Caesar and others to enter his home. The remaining section would be the lower right side only but with a circular half-column base and larger wall blocks. Note that this half-column base is part of a wall block and there is also a wall block next to it. So to the left of that half-column base would be the doorway into the Domus which is in line with the atrium as it should be. So just remember when there to stand across the street from the #27: Temple of Antoninus and Faustina, with your back to that temple, then turn 45° to the left toward that group of trees. Walk around until you can find the travertine half-column stylobate beyond the fence. When you can best line up that stylobate # with the modern roofed structure [x=x] behind it #[x=x] and stop there. You're now looking through the front door of Caesar's home. Think of the others who have also walked through that door to visit Julius Caesar... Marc Antony, Brutus and a young boy visiting his great-uncle who will one day inherit his Empire as Julius Caesar's adopted son and heir. In my opinion the archaeological evidence is overwhelming and rock solid for this as the main entrance door location into the Domus Publica. So an impressive wall and with the front door # into a short corridor -- with a service room on each side, into the beautiful Atrium [x=x] under the modern roof, with the Impluvium = in the center, and then the fancy impressive [T]ablinum #--[x=x][T] . With bedrooms, a dining room, etc off both long sides of the Atrium and likely a second story at the least. This Stylobate dates to the time of the Julius Caesar as does the rest of this excavated House of the Pontifex Maximus. I'm convinced that it is the main entrance to the Domus Publica and the doorway used by Julius Caesar when he left home on the fateful morning of his assassination.